The world of Pyrrhic Victory has changed quite as we created new nations. Conceptually the land was once round with nations occupying equal shares of land around the continent. Alas, not every nation is as interested in land, nor powerful enough to protect it. The nation of Rupani has dominated the entire left half of the continent, holding onto it with a strong navy to defend the coast and a nigh impenetrable mountain preventing armies from invading by land. On the southern half of Rupani lands is the Wu’kay Yu – deadly swampland. The swamps are full of large insects, poisonous spiders and deadly reptiles. The nation of Rupani started in this land and the toughness of ancestors is still seen today. Shuicheng was the first city they created after leaving the swamps. In the middle of the Wu’kay Yu is the Gai Focao – a deadly area where no one ever returns and little is known. There are also three forts within the swamps, partially for punishment for soldiers but also to ensure Slahor soldiers don’t sneak north while providing backup for Shuicheng and Chengshi. 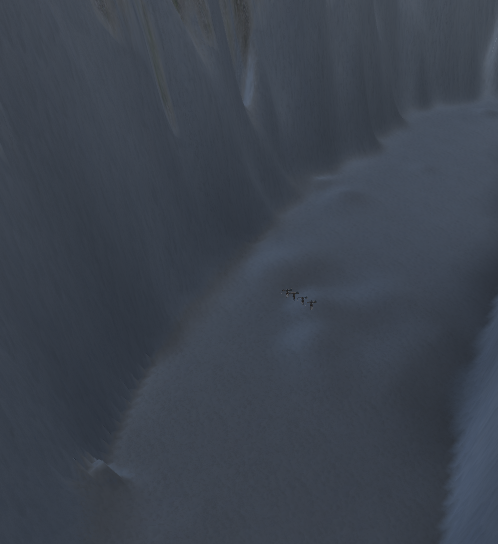 The far north of the land is the Ngahn Laahng, tundra wherein little lives. The frigid land has only the city of Romik at its edge, with Mah Bao watching over the road. While this part of the land is more open to invaders, the landscape itself is barren of most life and hard for an army to march through. Occasional raiders might sneak down but rarely in any sort of large groups. 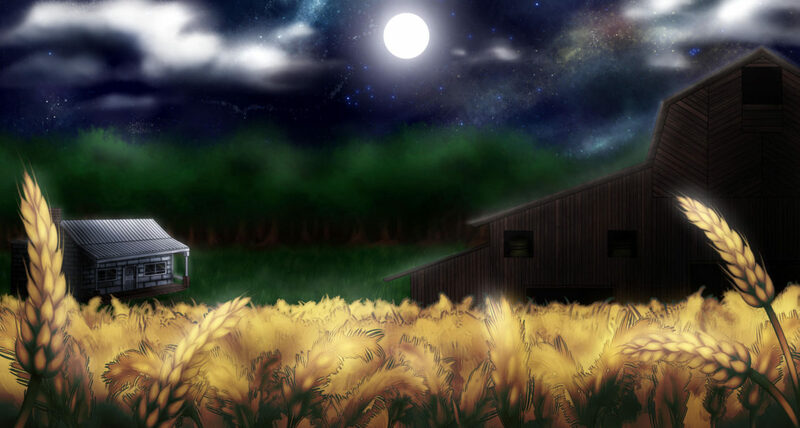 Between the swamps and tundra lie the plains called the Pihng Deih – these plains are the heart of the nation. Most of the food that Rupani eat, as well as their livestock, are grown in this part of the nation. For the most part the plains are flat and empty of danger – with small foxes being the most common worry. 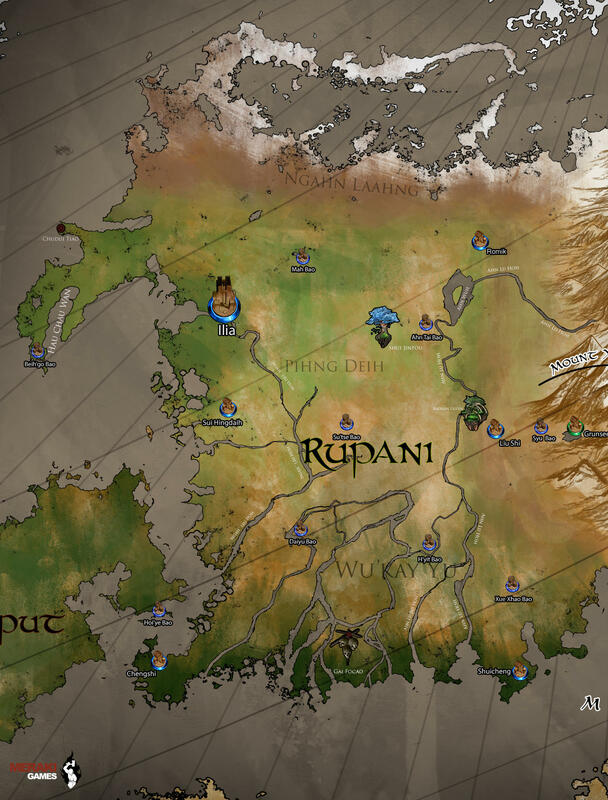 Most of the cities of Rupani, including their Capital Ilia and the little Capital Sui Hingdaih are here, as well as the Lonely Grove Shui Jintou. To the east of Rupani land is the Yao Feng Divide which prevents large armies from crossing unseen and has its own challenges. To the north, west and south of Rupani lie the various seas of the world. With Rupani natural nautical mastery, they are difficult to attack by sea. The Rupani nation has the most powerful navy in the known world with Yundoh Lunwui (Casters able to manipulate water) able to give them even more of an edge with their long tradition of shipbuilding. We’ll be going over the story behind the other landmarks on the map in the future, such as Gai Focao – the swamp of death where no one who enters returns, and Shui Jintou, the lonely grove which was born from the sacrifice of a great hero. Stay tuned for more info on the Rupani lands and the rest of the world! We’ll be posting the map with our future tours in order to help you locate where it takes place. Be sure to check back in on Friday for the next part the tour – we travel to Ilia, capital of Rupani. You can keep up to date with us on our twitter or facebook as well. The Rupani military takes war very seriously. Having been almost constantly at war for the last several hundred years, the Rupani nation has risen to the challenge by enforcing a mandatory 2 year military service for every able-bodied adolescent, male or female. Deserters from the military and those too weak to pass the tests bring dishonour to their family and ancestors. Many have been disowned by their families for failing, to avert the dishonour. Every child of a Fraehalder will have learned basic weapon training and many go on to have successful careers in the military. It would be a poor Fraehalder that didn’t know how to fight; it would be difficult to rally the militia, fight off invaders and keep their title. A Fraehalder that can’t fight would be quickly displaced by the King. The Rupani military is large horde led by a single General – a position which is acquired through trial by combat. Under the General is a Sub-General, his/her direct replacement if the General perishes. Further down the chain of command are the Commanders. Commanders report to the local Fraehalders, but take orders from the General and the King alone. The rest of the army is made up of the warriors (as seen above), the archers, cavalry, engineers, and Watercasters. The military transports physicians on loan from Yi Shae Yu’an Moshu – a Rupani medical school to treat their wounded and sick. We’ll see more on the other parts of the Rupani Military later. As Rupani is heavily focused around their Navy, they have developed their fighting styles around ship fighting; the equipment which the Navy and Land Army use are nearly identical. Rupani Warrior outfit. 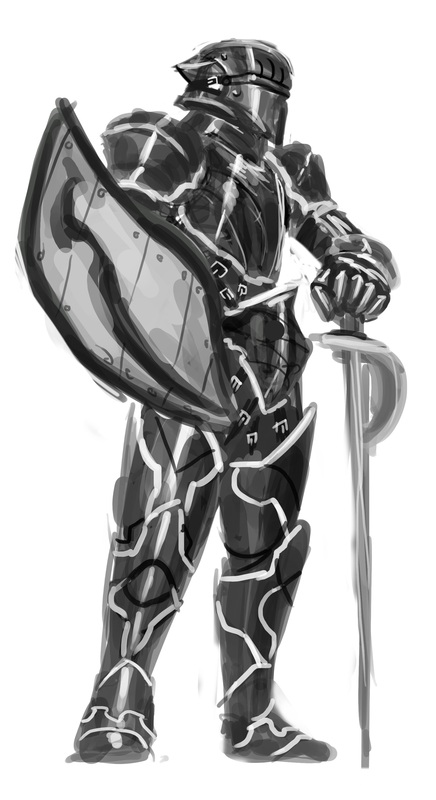 The traditional armour of the military is a steel breastplate, pauldrons, bracers and greaves with a wooden shield. Naval soldiers don’t wear the pauldrons or greaves. The Rupani nation produces (and steals), a vast quantity of quality steel. They forge all weapons and armour (except for shields) out of steel to ensure maximum strength. When on land, the soldiers wear steel greaves, and pauldrons which are too heavy to wear on a ship. All of the plates are held together with dark green leather straps which are treated to prevent shrinking and stretching when wet or heated. To ensure that a soldier can escape drowning in their armour, quick release compression clasps are hold the front/back plates together – this allows the soldier to swim out of their armour in seconds if they fall into deep water. Warriors also carry round wooden shields. The shields of soldiers are typically painted with their ancestral family crest. The warriors typically use Rapiers, although they also field spear warriors. Every soldiers carries a Sgian, a type of curved cutting knife. 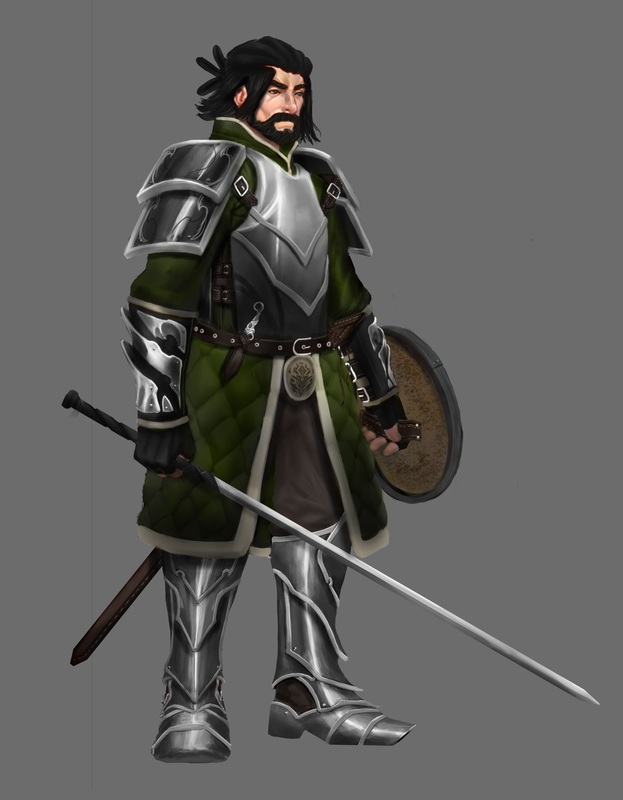 The Rupani warriors tend to attack with skill and speed, preferring the rapier over thicker weapons. Most warriors are adept with rapiers and are able to create a tough guard with their rapier and shield, while rapidly attacking the foe. Due to this agility, the Rupani don’t fight in formation, attempting to overwhelm the enemy with sheer number and personal skill to rout their foes as quickly as possible. In the event that they lose or break their rapier, every warrior carries at least on Sgian, a small razor sharp knife which has saved the lives of many soldiers. While rapiers are issued to soldiers by the military, Sgians are typically passed down through the family. Unfortunately, this style of combat is weak against charging foes, such as cavalry. To prevent a total rout from a soldier cavalry charge, the Rupani military trains some of its soldiers to form spear-walls. The spear-walls are made up of soldiers with increasingly longer spears which rest on the shoulders of the soldiers in front of them. The front row has the smallest spears and hold shields, while the back row wield spears up to 4 meters long. This bristling wall of spears (not unlike a porcupine) is daunting to charging cavalry and infantry alike – if they can position the spears between the enemy cavalry and the rest of the army. In addition, palisades will help in defensive engagements, and their own cavalry are often seen skirmishing with opposing cavalry when possible. For those that favour a strong navy – Rupani is right for you. If you have questions or comments we’d love to hear from you; drop a comment below (or on our facebook or twitter!). I hope everyone that observed Lunar/Chinese New Year had a good two weeks. I know I rather enjoyed the orange-chocolate that came out for the festival – a perfect welcome to the year of the Monkey! 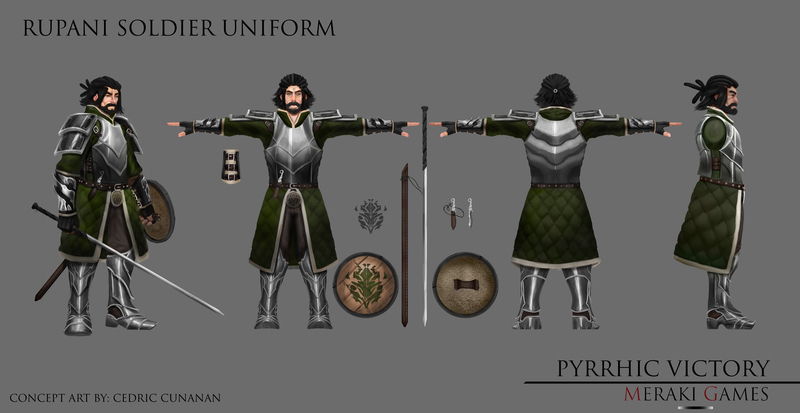 Today we have a sneak peak of the Warden, a unit in the army of the Nation of Kosekya. The Warden is similar to a Centurion in the Roman armies, enforcing order and leading soldiers into battle, but without the funny hat and with a few extra tricks. Every Warden is a Lightcaster (a person capable of manipulating light, which is Kosekya’s speciality) and is able to reflect sunlight and moonlight off of their armour to blind incoming foes, inspire allied troops or act as a beacon for a rally point. Their lightcasting abilities also allow them to signal allies or order troops across the battlefield. Unlike most of the armies of Kosekya(and most of the armies in the world), the horse-mounted Wardens wear full steel plated armour (including cuirass, greaves, gauntlets, helm, pauldrons, etc) with a tough polished steel shield. They are literal knights in shining armour on the battlefield with exceptional training in combat and tactics. It doesn’t take much to route the citizen militia armies once the Warden has fallen, yet it is a difficult task to take down the mounted mountains of metal for that very reason. Due to their skill in combat, it is common for a Warden to serve as bodyguards for the leaders of larger armies; a wall of metal against an ambush or charge. An especially skilled Warden might even be called to be the honourguard for a Governor of the one of the three Fortress Cities of Kosekya or even the King himself. I hope everyone had a great week since we posted some in-game screenshots of Pyrrhic Victory! The other day Andrey (our awesome 3d Modeler) presented me with some in progress screenshots of one of the weapons used by the nation of Slahor: the Shishpar. The Shishpar is a flanged mace with a sharp point on the top. With this deadly weapon you bash someone like a normal mace, but the sharp flanges rip through thin armour and skin with ease – and if that doesn’t work, you can always stab them with the tip. While the Slahor army marches in formation, they don’t fight in formation – the versatile Shishpar works perfectly with the spears, claymores and falchions that other soldiers in the army use. The shorter weapon allows the Shishpar soldier to close the distance once the longer reach weapons have shattered the enemy defense. The flanged mace allows the soldiers to rip through most enemy armour and even crack wooden shields. Take a look below to see why the Shishpar is such a great tool for the job, and how we made it! The first stage of creating the Shishpar was to create a high poly version of the Shishpar. This already looks amazing to me, and is a good starting point. It gives us a feel for how the weapon will turn out before Andrey spends too much time working on it. Getting to this point took about half of the total creation time, but modifications further down the line take a lot longer than making them now. In this case, I thought it looked spot on, so he continued on – he perfectly captured what we needed. Next is making the Shishpar low poly. Basically we want to turn the Shishpar into a low poly model so that it is smaller but still looks essentially the same as the high poly model. Smaller 3d models take less resources and load faster. In other words, we can have a bigger army of Slahor Shishpar warriors running around because our Shishpar isn’t taking up too much of the computer’s resources. While the resource save might not be much for an object as small as a Shishpar, every little bit helps when you reduce the polys for weapons, characters, armour, siege weapons etc. After the low poly version is creating the UV map for the Shishpar. This basically maps the Shishpar to a 2D map(U axis and V axis, like on a graph) that allows us to texture it and have the game engine know how to apply the texture. Once it is UV mapped we can swap out textures to create different looks – do we want a rusty Shishpar? How about a gold gilted Shishpar, or a pitch black one? 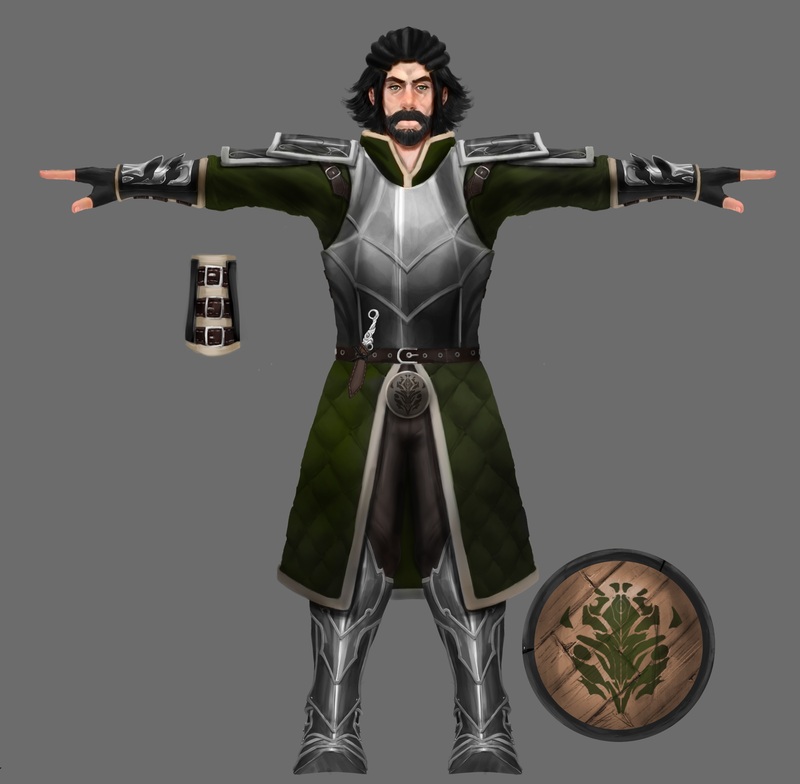 Once the UV mapping is complete we can change the texture map much more easily. One more screenshot before we’re done! 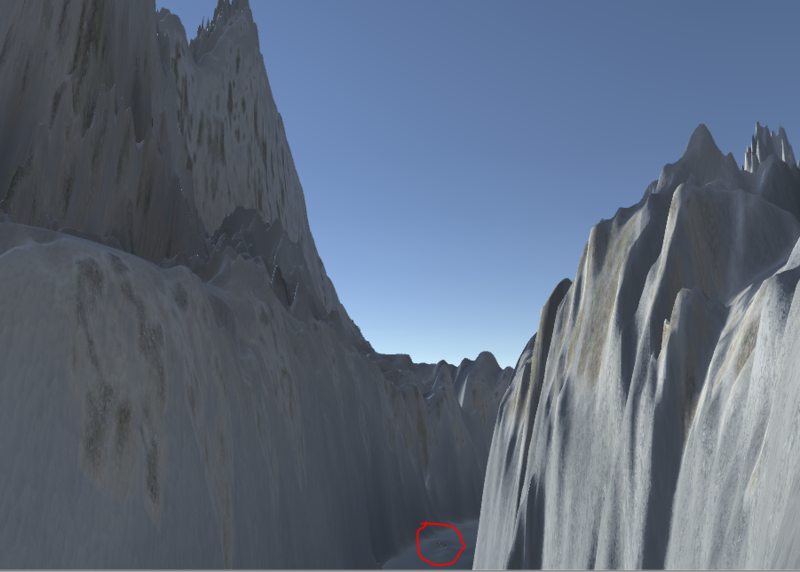 I think it looks as great as the high poly version – while using quite a bit fewer resources! 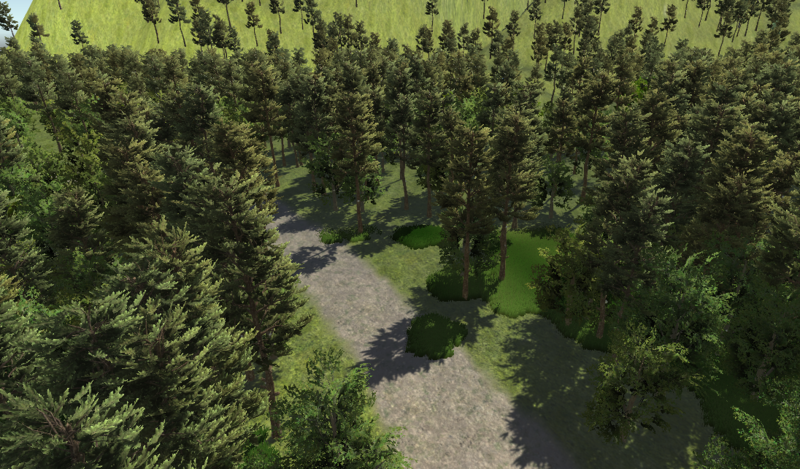 By now, Andrey has transferred all of the information from the high poly to the low poly, including baking in the different maps such as the normal map, used for by the engine to reflect light correctly. That’s it for now – I hope you all enjoyed a look at the creation process for 3d weapons. We’ll have more weapons to post soon. If you have any questions about the creation process, let us know and I’ll be sure to pass them onto Andrey if I don’t know the answer myself. Of course, also let us know what you think of the Shishpar. If you like what we’re making, please be sure to like us on Facebook or follow us on Twitter for more posts, and share/retweet what you can to help spread the word. See you all next week for more stuff in the works! Joni decided to rewrite her Lamenting Tree and we have added some great artwork by Savoula Tsoraklidis. Part 1 has been posted, and part 2 will arrive tomorrow with part 3 being posted on Tuesday.